Making a family tree in photoshop can be fun, it can be used at a family get together, this gift can be inexpensive and it will bring smile to everyone. 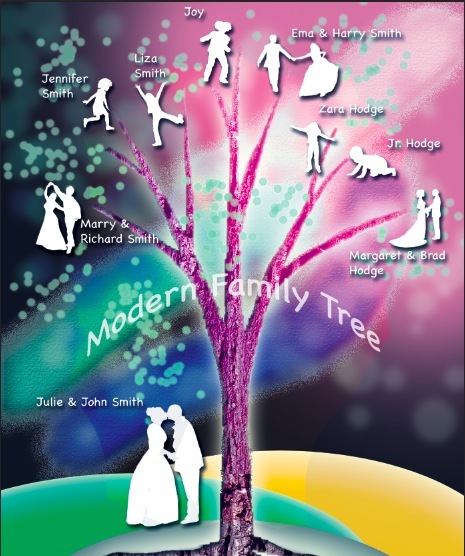 So, let’s get started and make this awesome modern / new age family tree. 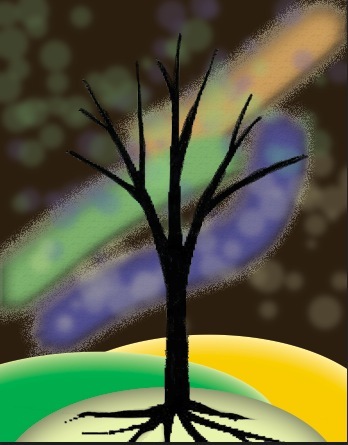 For the starters the things we will use are ellipses for mountain effect, tree with many layer styles, we can also use pen tool to make our own tree. 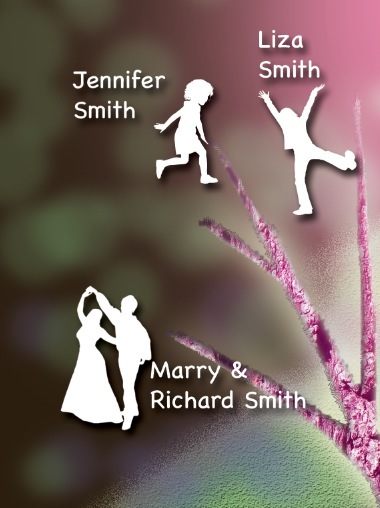 For family, we can use predefined shapes of teenagers (kids) and brushes for couple. If you want to use actual photos, then its fine, we will also provide tips for that. We will be using Hue/Saturation, color balance, color fill, linear dodge etc. 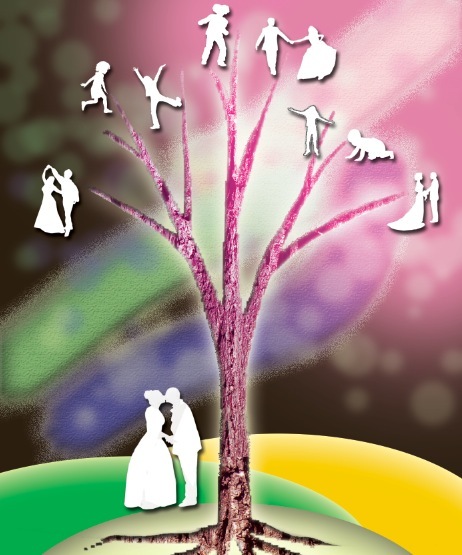 To give some more classy effect we can give bokeh effect which can be a replacement for tree leaves. It’s advised to group related layers for easier asset management. Create a new document with 235 mm width and 300mm height, 300 ppi. Fill the background with #291e10 colour. Draw three lines with three different colours using dry brush. add bevel and emboss, inner shadow and outer glow effect to it. Using Bokeh effect brushes add bokeh effect. Go to Filter>Blur>Gaussian Blur and apply a 24 pixel blur. This will make it more suitable as a background element. Use the Ellipse tool(U) to create three hill shapes at the bottom. We used the colours #34a344, #f3c81d and #ecefaf(foreground). Apply soft inner glows to the background hills and a soft Inner Shadow to the one in the foreground. 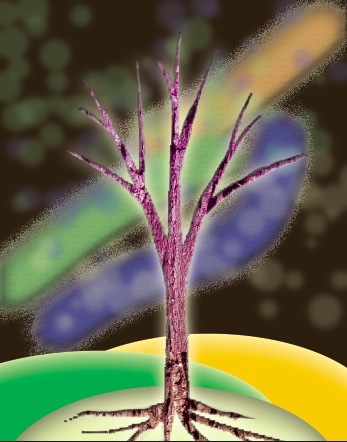 Here we can use either tree brush or an image or create our own tree using pen tool. 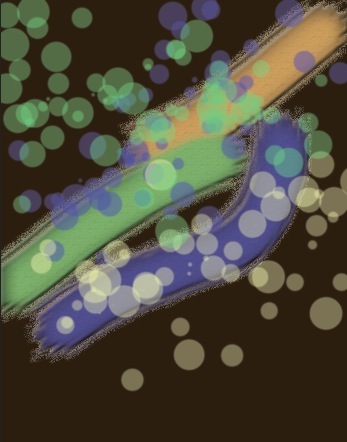 We have used an image and brush tool to add effects. 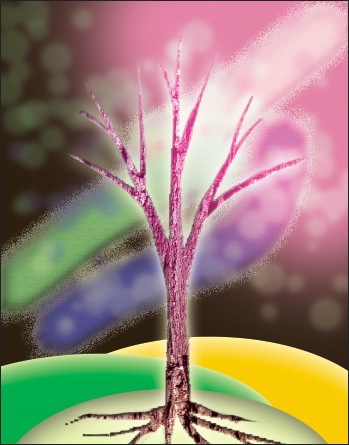 With the tree layer clicked add tree pattern, Inner glow, Outer glow, Inner shadow and gradient effect. you can examine and fiddle the styles you wish. Click the Create New Fill Layer button in the Layers palette to add a Color fill layer using #fOO6ff. Set the blend mode to Linear Dodge and drop Opacity to 90%. Paint the mask with black to remove eventhing except the upper-right tree area. There are many online resources for custom shapes in the CSH format. 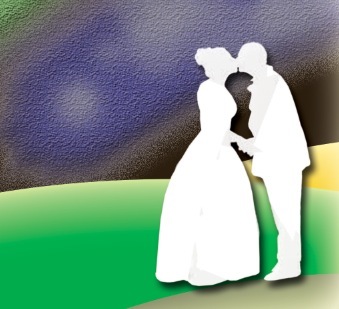 Go ahead and search for famiiy silhouettes to import, or download. Select the Custom Shape tool (U) and expand the preset drop-down in the Options bar. Use the Load Shapes option from the fly-out menu to import the appropriate CSH files. Set the foreground colour to white. Create a new layer. Select one of the silhouette shapes you loaded from your Custom Shape presets. 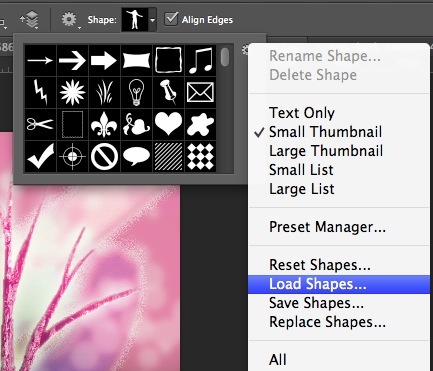 Photoshop users: select Shape layers from the Options bar. On the canvas, hold Shift as you Click and drag out your shape. Add a soft Drop Shadow. 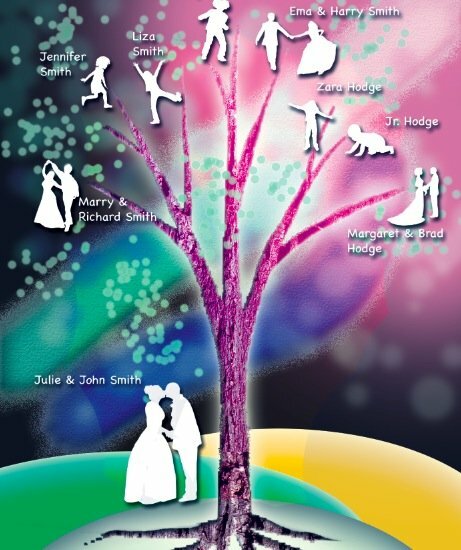 Now add the rest of the silhouette shapes to your composition. Be sure to create a new layer for each, and remember to hold Shift as you drag them out, keeping them in proportion. Use the Type tool (T) to add in names for each family member (we’ve used Chalkboard SE). Add drop shadows to help distinguish them from the background. Again use bokeh brush with #b4df6a colour selected. Add outer glow. 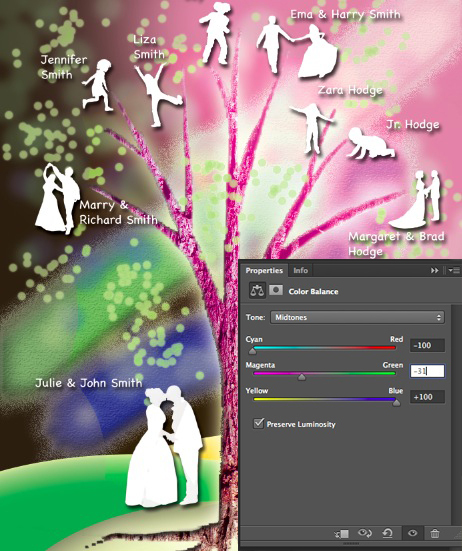 Click the New Adjustment Layer icon and choose Hue/ Saturation. Increase Saturation to +39. Paint black in the mask with a soft round brush to remove the effect from everywhere except the centre. 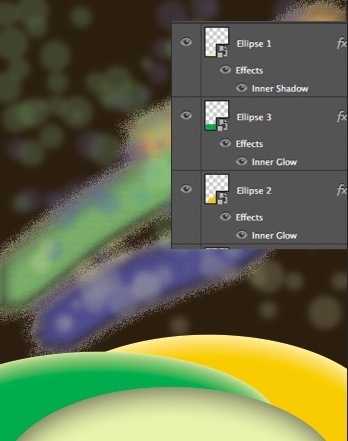 Click the New Adjustment Layer icon and choose Color Balance. For Midtones, set the sliders (from top to bottom) to -100, -31 and 100. Paint black in the mask with a soft, round brush to restore some of the original colour. And you’re done!